Custom double sided magnets offer you double exposure for the price of one! You can use the front side of this magnet for imprinting your brand information and backside for managing other amusing information. 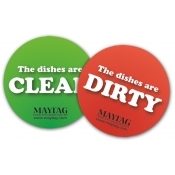 Advertisers can buy attention of their prospective customers by handing them these colorful two-sided magnets. 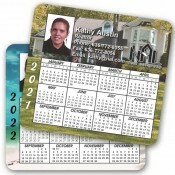 Order printed double-sided magnets in bulk and save with our wholesale prices. 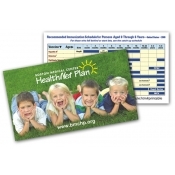 Employ these double-sided magnets for refrigerator advertising and seek long-term benefits. Made in USA. 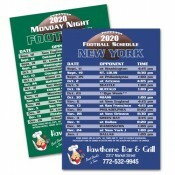 Custom two sided magnets are perfect for businesses and individuals trying to make an impact on the crowds. You can choose from our vast collection of these two-sided magnets offered in different sizes, shapes, and designs. Double-sided house shaped magnets, double sided rectangle magnets, double sided magnets red green and double sided phone shaped magnets are some best sellers in this category. 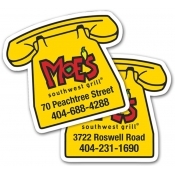 Custom refrigerator magnets – two sided are sure to become an extension of your business or personality with their dual imprint area. You can hand out them during convention, conferences and even send them as a mailer. Everyone would love to stick these colorful two sided magnets over their refrigerator doors or other metallic surfaces, such that everyone can see them. At first, they may not think of it from a business point of view, but slowly your information will grow up on their minds. 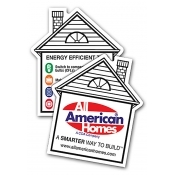 Customizable refrigerator magnets imprinted with full color printing are first offered as a refrigerator art, but it takes no time for them to become a full-fledged branding item. Custom printed refrigerator magnets two sided are also great for announcing your wedding, graduation, arrival of baby, promotions, anniversaries, etc. You can stay assured of their success because people always love to decorate their work places, refrigerator doors and others with colorful magnets, whenever they can. To know more about savings and imprint choices over these magnets, feel free to contact our team at 855-762-4638 or mail at info@Cmagnets.com.